*IF YOU DO NOT RECEIVE A CONFIRMATION EMAIL AFTER SUBMITTING YOUR PAYMENT, PLEASE CHECK YOUR SPAM FOLDER AS WELL, AS THE CONFIRMATION MAY HAVE BEEN SENT THERE, IF NOT FOUND THEN PLEASE EMAIL NUCZEN@STBENEDICT.COM BECAUSE YOUR REGISTRATION MAY NOT HAVE GONE THROUGH. *Full payment is required at the end of this registration. If you need financial assistance, please complete this registration and email nuczen@stbenedict.com with your request for assistance. *Religious Education Registration deadline is SEPTEMBER 1, 2018 Walk-ins will not be accepted on the first day of class. *There will be a separate registration for the Sacraments of First Eucharist and Confirmation sent out in the fall. Totus Tuus is a fun and energetic Catholic youth program taught by seminarians and college students throughout the Diocese of Joliet. From catechetical teaching sessions, Sacraments, and Mass to songs, games and skits - your child is sure to have fun while learning more about their Faith! Totus Tuus seeks to inspire in young people a true longing for holiness, a deep desire for daily conversion, and an openness to their vocation by constantly challenging them to give themselves entirely to Christ through Mary and by continually strengthening their prayer lives in imitation of Her. Totus Tuus, a Latin phrase meaning “totally yours,” was the motto of St. John Paul II. Taken from St. Louis de Montfort’s True Devotion to Mary, it signifies our desire to give ourselves entirely to Jesus Christ through the hands of our Blessed Mother Mary. It also expresses our effort to give all that we have to every young person we encounter. 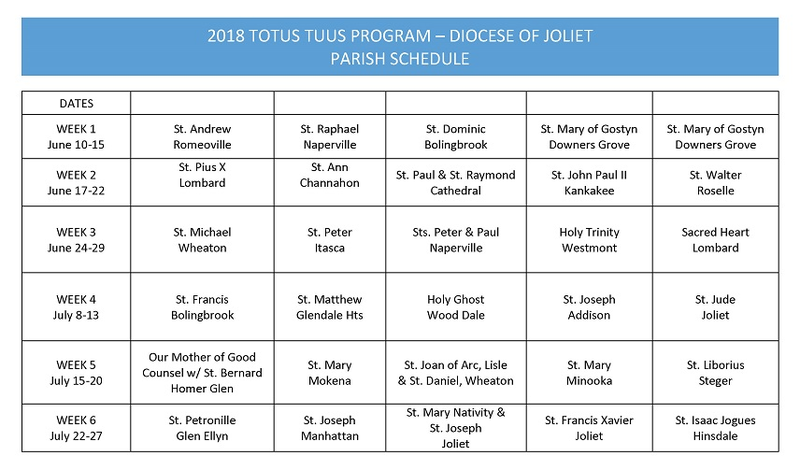 The Diocese of Joliet has executed the Totus Tuus Program each summer since 2009, recruiting parishes throughout the diocese to host. You may register your children at any or multiple parishes if you like, according to the location and date that work best for your family. After registering with the diocese, the parish you choose will get notification and that coordinator will then be able to connect with you to inform you of the details that may be unique to that parish’s program. Your child is encouraged to evangelize by inviting a buddy to attend! Let’s grow the Kingdom of God together! Who has permission to pick up your child? Does Child have any allergies? If so, please specify below. If not, please type "No" in box. Does Child have any special needs? If so, please specify below. If not, please type "No" in box. Digital Signature Please type your full name in the box below. By typing your name, you are signing this registration and confirming that you have read and agree to all of the above statements. Parents/guardians of participants in Religious Education program are advised that photographs or digital recordings of students may be used in publications, websites or other materials produced from time to time by the St Benedict Parish. (Participants will not be identified, however, without specific written consent). Parents/guardians who do not wish their child(ren) to be photographed or digitally recorded should so notify the parish office. Please note that the we have no control over the use of photographs or digital recording taken by media that may be covering the event in which your child(ren) participate(s).